The T-Mobile Arena in Las Vegas, Nevada will play host to UFC 216, which features two title fights. 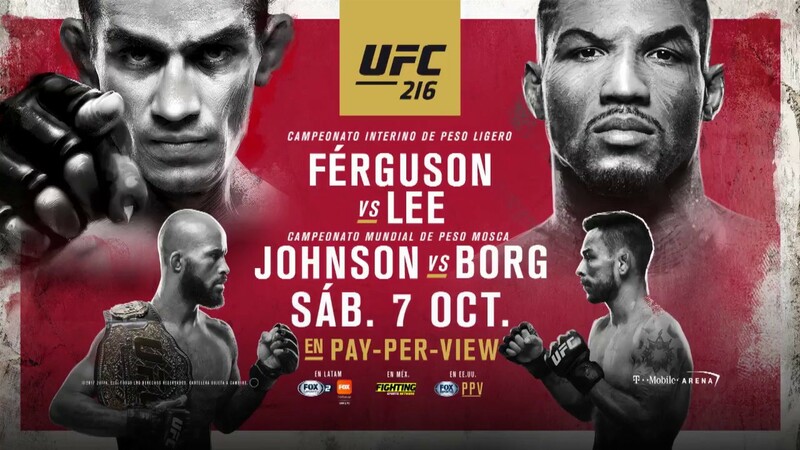 Headlining the card is an Interim Lightweight Championship fight between Tony Ferguson and Kevin Lee. Ferguson, who comes into this bout on a nine-fight win streak is the consensus number one contender (despite UFC Rankings) in the Lightweight division. A title shot is more then due and with a victory, perhaps a money fight with Lightweight Champion Conor McGregor is possible. As for Lee, the young phenom has knocked off five consecutive victories and earns this opportunity for gold with a little luck. The 7th ranked Lightweight according to the UFC Rankings obviously wasn’t the first choice, but with scheduled fights (#5 Justin Gaethje vs. #3 Eddie Alvarez), Injuries (#4 Edson Barboza, #1 Khabib Nurmagomedov) and Holdouts (#6 Nate Diaz), Lee was next in line and willing to sign the dotted line. Co-Headlining the card is a Flyweight title fight between Champion Demetrious Johnson and challenger Ray Borg. Originally, this Flyweight Championship fight was due to take place at UFC 215, but was scrapped when Ray Borg had to pull out due to an illness. Johnson, the consensus #1 Pound for Pound fighter, heads into this bout on a twelve-fight win streak and with an opportunity to make History. With already ten consecutive title defenses, Johnson is tied with Middleweight great Anderson Silva for the most ever in UFC History. A victory over Borg would put Johnson in a league of his own, and immortality.. As for Borg, an opportunity to play spoiler and win UFC gold is on the line. Coming into this bout on a two-fight win streak, the “Tazmexican Devil” is finding his stride at the right time. Will he seize the opportunity? We’ll see! 155 lbs. : Tony Ferguson vs. Kevin Lee for interim lightweight title – First off, I’m super high on Kevin Lee. His cockiness fuels his confidence, but sometimes that gets you into trouble like against Leonardo Santos. However, make no mistake, Lee is a superstar in the making. The way he talks and fights is going to get him into huge fights such as this. But, when I saw a drained Kevin Lee not make Championship weight (155 lbs), only to come back an hour later and make it, I wonder what effects this might have on the fight. He’s clearly outgrowing this weight class (Lightweight) and he looks super unhealthy cutting weight. And I really believe this weight cut is going to hurt him in this fight. Ferguson is very talented on the feet and a monster on the mat. His unpredictability and wild style make for exciting fights, but one’s in which he comes out on top via something spectacular. Now that Lee had troubles making weight, I believe Ferguson will focus on the body. Attacking the body will zap the life out of a Kevin Lee, who I can’t see having the energy to make it to the Championship rounds anyways. So with that, I have Tony Ferguson winning the Interim Lightweight belt via submission (D’arce). 125 lbs. : UFC Flyweight Champion Demetrious Johnson vs. Ray Borg – With history on the line (11 consecutive title defenses), there’s no way Demetrious Johnson will let this fight slip from his grasp. He’s the best all-around fighter in the UFC and sure his competition isn’t the best, but he dominates and finishes them. He could very easily lay and pray and win, but he doesn’t. He goes for the kill and that often goes overlooked, very much like this historical attempt at eleven consecutive title defenses. Anyways, Borg is a talent. His grappling and submission abilities are upper echelon, but his striking is not very good. If he could shore up that part of his game, and he’s young, he could very well be a legit threat to Johnson. However, at this current moment, Borg’s striking is sub-par. Against Johnson, sub-par Striking isn’t going to setup takedowns. It’s going to get you systematically picked apart. So with that, Johnson takes this fight wherever he wants and eventually submits a tired Borg in the Championship rounds. 265 lbs. : Derrick Lewis Walt Harris vs. Fabricio Werdum – Walt Harris was going to have an awesome night, as I believe he was going to piece up Mark Godbeer. Now, he’s stepping in last second for an injured Derrick Lewis to take on Fabricio Werdum. It’s a huge opportunity and unbelievable chance catapult into the top five of the Heavyweight division. However, I don’t foresee Harris landing the knockout blow. Instead I foresee Werdum submitting Harris in the very first round. 125 lbs. : Mara Romero Borella vs. Kalindra Faria – Honestly, I have no idea. Originally Andrea Lee was supposed to fight, which I was pumped for…and now I’m clueless here. So with that, I guess I got Faria via decision. 155 lbs. : Beneil Dariush vs. Evan Dunham – Fun fight and I have to give some kudos to Evan Dunham for reviving his career, but Dariush is a darkhorse in this division. He’s very well rounded, with top notch grappling and technical striking. Dariush is excellent with his use of range, playing the game of hitting and not getting hit back. I believe Dariush will frustrate Dunham on the feet, picking him apart slowly en route to a decision victory. 135 lbs. : Tom Duquesnoy vs. Cody Stamann – Don’t know too much about Stamann, but I’ve seen Duquesnoy. He’s a young and talented striker, but in his UFC debut, a wrestler almost knocked him out. Duquesnoy looked a little sloppy before finishing his opponent, but I chalk that up to UFC jitters. So with that, I believe that Duquesnoy will show off his talents here properly to the world and knockout Stamann. 125 lbs. : Marco Beltran vs. Matt Schnell – Um…. Schnell via decision. 155 lbs. : Bobby Green vs. Lando Vannata – This fight isn’t getting enough love. It’s almost guaranteed to be fireworks, as you have two strikers that won’t back down. However, I’m going with Vannata. As good of a striker Green is, he’s actually a wrestler first, but he’s fallen in love with talking trash while striking with opponents. That didn’t work against Dustin Poirier and it won’t work here. Vannata is a dynamic striker with an arsenal that is going to put Green to sleep. So with that, I got Vannata via KO! 115 lbs. : Poliana Botelho vs. Pearl Gonzalez – I have no idea about this fight, as I’ve only seen Pearl Gonzalez fight for as little as her debut went. However, I’ll just side with her based on that… Gonzalez via decision. 265 lbs. : Mark Godbeer vs. Walt Harris (Fight Cancelled, Harris taking place of injured Derrick Lewis) – I used to believe that Walt Harris was just a massive man with very little skill and no chin. Well, I was wrong. Harris is a good striker with plenty of pop, as he’s reeled off two consecutive knockout victories. His opponent Mark Godbeer isn’t very good, as his cardio and striking are sloppy at best. So with that, I got Harris via KO! 125 lbs. : Magomed Bibulatov vs. John Moraga – I don’t know what happened to Moraga, but ever since defeating Willie Gates back in 2014, he’s been a shell of himself. That crisp boxing with legit power is no more and what happened to that sneaky guillotine choke he’d slip in while defending a takedown? Bibulatov is very talented and if he can shore up his striking, he’s going to be an eventual threat to Demetrious Johnson. I believe he’ll use a heavy dose of grappling to wear down and edge out Moraga. So with that, I’ve got Bibulatov via decision. 185 lbs. : Thales Leites vs. Brad Tavares – This one is a toss up, but I’m going to go with Thales Leites. Although his gas tank is suspect, he’s vastly improved his striking abilities to go along with his already top notch grappling and submission game. So with that, I’ll take Leites via decision.